When I was young, I remember being so excited to help my mom decorate the house for Christmas. I felt like such a big girl, putting ornaments on the tree, placing tinsel icicles (remember those!) on the branches just so. My favourite part was spraying faux snow on the windows. That was always my job. This Christmas being Chloe's first where she can really experience the season, I was intent on starting to make some holiday memories for her. So we tried to do some crafts. First, we tried to make some pom poms. Big disaster. I tried a simple finger knit pom pom making method, but Chloe wouldn't let me wrap the yarn around her fingers, and when I finally did get a pom pom made she would start to pull out all the individual strings. 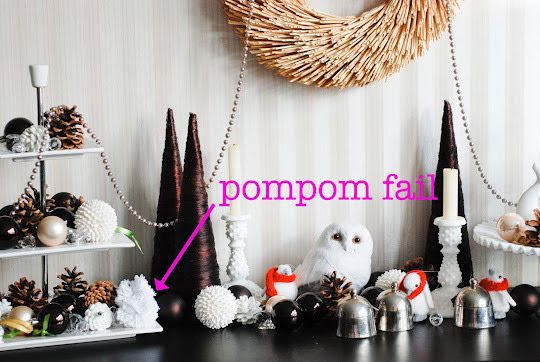 I threw in the towel and used the rejected pom poms as part of my sideboard decor. Then we tried to create this pretty paper garland. A 19-month old can operate a hole punch, right? Sure... so long as that 19-month old will sit down longer than the 17.8 seconds that Chloe typically sits. Another failure. Finally, with the help of Grandma, I found a craft that Chloe would actually like doing. With two big sheets of craft paper and her new paints, the kid went to town. 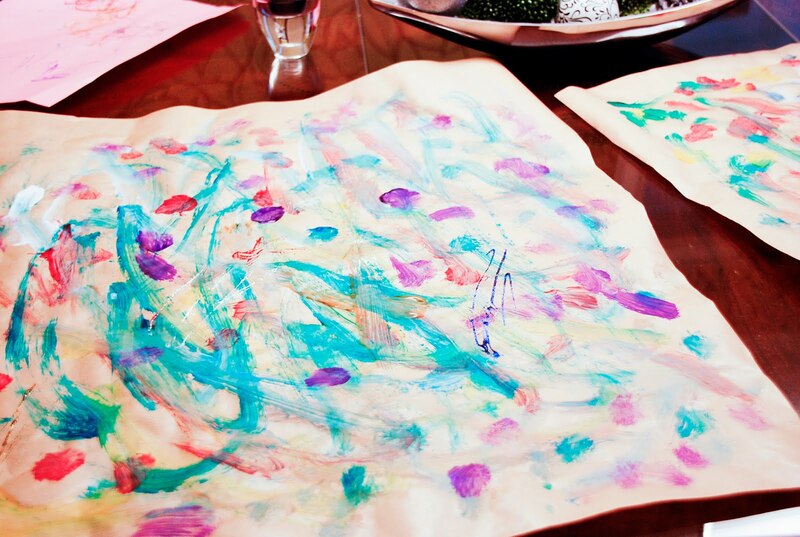 She created these masterpieces. And I used those masterpieces to wrap gifts for Lisa's lovely children. And I used those hole punched circles for the tags. And we finally got one holiday craft done, under the tree, and stored in the little one's memory bank. Yay! Tell me, what holiday traditions do you have with your kids? What lovely wrapping paper. I hope whoever get it opens it carefully to frame afterwards. 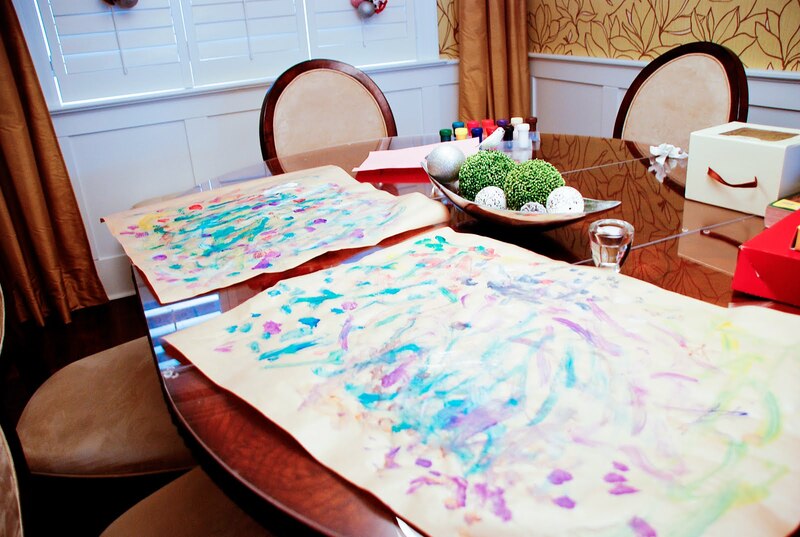 You never know you might have a little artist on your hands. You do watch the antiques road show dont you? this is how most of my kid crafting sessions go...its best not to have any expectations. love the paper painting...really pretty and practical!! my kids all "buy" my husband presents- we go to the store together. it's fun. we actually have a load of traditions lol. I'm surprised you got this far! The wrapper paper is so cute and so personal. Maybe I'll try with my little guy next year...I have just stuck to crayons for now because paint makes me nervous! Ha ha. The paintings as wrapping paper looks wonderful!! As a kid I always remember that our whole family would decorate the tree together while eating cheese, cracks, kabossa and Christmas baking. And that mom always did the best job with the tinsel!! I can relate! No crafts for Dmitri this year...I just don't think I'd survive him finger painting just yet. But that's such a cute idea for wrapping paper! Must remember that next year! How darling the paper is...I still hang the ornaments from our daughter's and elementary school on our tree...love the memories!! 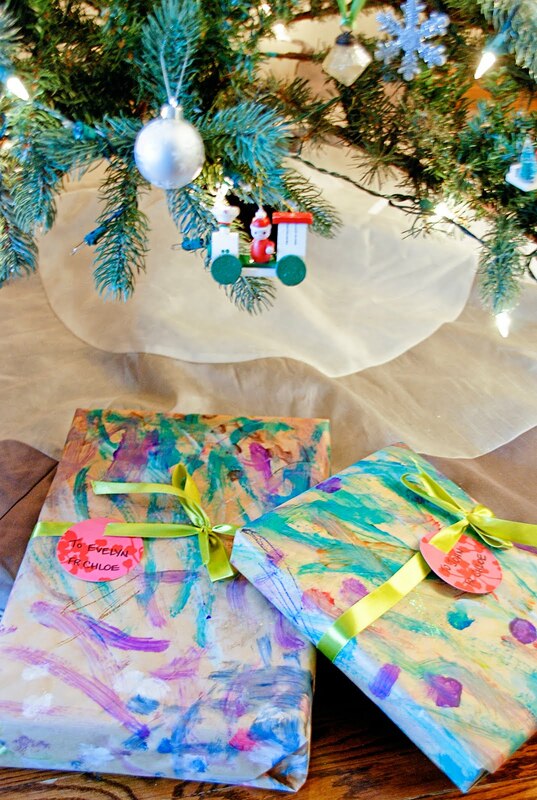 I love the finger painted wrapping paper!! Sorry that the crafts didn't all work out - next year will certainly be better I'm sure. One of my sisters, travels from Montreal to make a gingerbread house with our kids.This is a sure sign of Christmas in our house! I totally remember tinsel - I loved it but it got EVERY where. Including in our dog's mouth... which led to it coming out.. well, you know ;) haha. I LOVE the wrapping paper idea. A friend once gave me a gift wrapped like this and I thought it was so, so sweet.